Always great to be working in the Compass Room at the Lowry! Up on the 4th floor with panoramic views of Salford Quays & Manchester, this function room provides quite the unique setting for events & parties. On this occasion, the Winters family had hired DJ Andy B for their son’s Bar Mitzvah celebration. Andy plays for several Bar (& Bat) Mitzvahs throughout the year. A little information about the service he offers; His full mobile rig consists of a top quality sound system (as appropriate for the size of your party), a selection of lighting effects plus star booth. In short, it’s a professional set up. 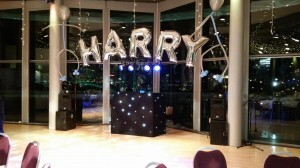 Andy carries a comprehensive selection of music & will be able to cater for most requests on the night. Beforehand, you can go through specific requests for the evening At this point, you could prepare a whole set list if as required. You can have as much pre event communication as required to ensure we get it just right on the night. If you require any Israeli music; he has a fairly good selection of the traditional music for dancing too, this usually works well at the start of the evening. Typically, we’d get everyone to their seats… maybe the younger guests around the dance floor, big intro for the ‘man of the day’ then encourage everyone to join in the traditional dancing for 15-20 mins or so. He also has a couple of contemporary dance tracks & a couple of finale tracks if required. As well as the disco, he will also act as the host for the evening if required – making any announcements, introducing the speeches etc. He’s there all night & will fit in with how you want your evening to run. But if you do want any suggestions for timings etc, we can help out. A typical Bar Mitzvah would open with the dancing (see the short video clip below) then food, followed by speeches & party time to finish with. Prices to cover up to 4 hours (7pm till 11pm for example), is £325. Any additional time is £30 per hour. Price is based on Andy arriving approx. 75-90 mins prior to the start time to set up. As well as the disco lights, we can also provide uplighters around the venue to help create the atmosphere, these are £14 each or £120 for 12. We will set them up at the same time as the disco & can set them to your preferred colour. 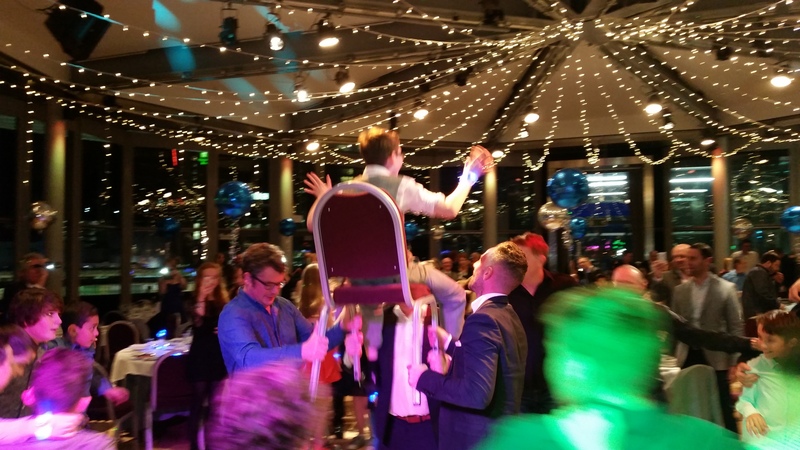 We also offer a range of related services & products which are popular for Bar Mitzvahs including photo booths, dance floor hire, fun casino tables, chair covers/venue décor & live entertainment. Just let us know if you’d like details on any of these.